Before he died in 1851, Petar II Petrovic Njegos named his nephew Danilo as his successor. He assigned him a tutor a send him to Vienna with a massage for a Russian representative who would forward him to Russia to further his education. According to some historians Njegos himself was most likely preparing ground for the new ruler of Montenegro to be a secular leader. However, when Njegos died, the Senate, under influence of Djordjije Petrovic (the wealthiest Montenegrin at the time), proclaimed Njegos's elder brother Pero Tomov Petrovic as Prince (not Vladika). Nevertheless, in a brief struggle for power, Pero Tomov, who commanded the support of the Senate, lost to the much younger (22) Danilo who had much more support among people (Jagos Jovanovic, Stvaranje Crnogorske drzave i razvoj Crnogorske nacionalnosti, 1947, Obod-Cetinje, p. 233). Prior to the determination of Njegos successor, after making peace between Crmnica and Katunjani tribes, and being recognized by Brda and all Montenegrin tribes except for Bjelopavlici, Danilo traveled to Vienna and then Russia, supposedly to be ordained as Vladika, not Prince. When he returned from Russia (1852) he took Pero Tomov and his supporters by surprise, bringing with him the endorsement from the Russian tzar to become Prince of Montenegro. Thus somewhat unexpectedly, Danilo became the Prince and Pero Tomov conceded defeat by returning to his position as president of the Senate (J.Jovanovic, Stvaranje Crnogorske drzave i razvoj Crnogorske nacionalnosti, 1947, Obod-Cetinje, p. 238). After centuries of theocratic rule, Danilo Petrovic was thus the first Montenegrin secular Prince who did not also hold the ecclesiastical position of the Vladika. He was laying down the foundations for Montenegro to become a kingdom but did not live long enough to see his ambitions realized. Like most leaders from the Petrovic dynasty Prince Danilo was a formidable civilian and military leader. Aided by his charismatic elder brother, Grand Duke Mirko Petrovic, Danilo won a crucial battle against the Turks at Grahovo on 01.05.1858. Montenegrin forces (5 800) inflicted heavy losses to Turkish forces and were left with a considerable arsenal of war trophies. This major victory had even more diplomatic than military significance. The glory of Montenegrin weapons was soon immortalized in the songs and literature of all the South Slavs, particularly the Serbs. More importantly, this Montenegrin victory forced the great powers to officially demarcate the borders between Montenegro and Turkey, de facto recognizing Montenegro's centuries-long independence. In November 1858, the commission comprised of foreign powers representatives demarcated the border between Montenegro and Turkey. Montenegro gained Grahovo, Rudine, Niksic's Zupa, more than a half of Drobnjaci, Tusina, Uskoci, Lipovo, Upper Vasojevici, and the part of Kuci and Dodosi. In domestic affairs, Danilo was an authoritarian and sometimes brutal ruler. As it happened, the centralization of his power contributed to development of the modern functions of the state. Danilo used the Law of Petar I Petrovic (Zakonik Petra I), as an inspiration for his own General Law of the Land (Opsti zemaljski zakonik or Danilov Zakonik). Danilov Zakonik was based on the Montenegrin traditions and customs and it is considered to be the first national constitution in Montenegrin history. Danilo organized first census in Montenegro (1855) and ordered that all montenegrins households be recorded. According to the census Montenegro population was 80 000. His plan for tax collection was accepted (out of fear of the hot-tempered and sharp Prince) by all tribal heads except Kuci. 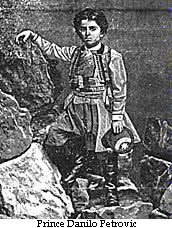 In order to punish Kuci Danilo sent Duke Mirko (1856) "not only to slay all leaders (12) but also to kill even the babies in cradles". In this extremely cruel quest (Pohara Kuca) Duke Mirko killed 247 people (only 17 potential soldiers the rest elderly and kids), and forced Kuci to pay the tax thereafter(J.Jovanovic, Stvaranje Crnogorske drzave i razvoj Crnogorske nacionalnosti, 1947, Obod-Cetinje, p.263). Danilo's forces also committed atrocities in Bjelopavlici, but the damage was limited by giving high ranks to the Bjelopavlici's rebel leaders. Prince Danilo paid special attention to education and literacy of his people. In 1855 he sent four people to Russia and 16 to Serbia for education. Only eight of them returned (from Serbia) and four of them became senators. Prince Danilo had the Senate under his control. At least 14 out of 16 senators were his man. In any case he could overrule the decision of the Senate. In foreign affairs, Danilo fought Turkey striving to enlarge the territory and achieve a recognition of his state. He was particularly keen to strengthen relationship with people in Herzegovina who he called "same-blood and same-religious brothers". His support to Herzegovina's rebels lead him in direct confrontation with Turkish forces at Grahovo. After this colossal victory over Turks, Montenegrin quest for formal recognition could no longer be overlooked by major powers. Danilo sought in Russia a military ally while trying not to upset Austria. His educated and wealthy wife together with Russia' s failure to live up to promise for Montenegro's international recognition of full sovereignty, heavily influenced his Francophile attitude. Needless to say' this Francophile attitude was detrimental to Danilo's relations with Russia, Austria and Serbia, who saw the good relations between Montenegro and France as a threat to their interests. At the same time, all major European powers (particularly England and Austria) worked to undermine Russian influence on Balkan, which was the strongest in Montenegro. Knowing the mood of his people, Danilo refused to compromise on sovereignty of Montenegro averting to the extent the pressure from Europeans. At the same time Russia was in no position to help Montenegro after suffering a defeat in the Crimean war (1854). In the subsequent Paris congress (1856) Russian government representatives did not have enough strength to support Montenegrin demands for the independence and territorial enlargement. However, the Russian government replied on Danilo's memorandum "that the Russian government has always recognized the Montenegro's independence and will always do so regardless of the position of other great powers". During the trip to France Danilo received some financial help (200 000 franks annually) from France hoping that France would insure the formal recognition of Montenegro's sovereignty. By the same token Napoleon III hoped that this would bring Montenegro closer to French influence on the expense of the Russia. This act of Prince Danilo earned him many enemies since it was seen by many influential Montenegrins as a betrayal of Russia. The opponents of the Prince grew in numbers and included Danilo's brother Duke Mirko and the president of the Senate Djordje Petrovic. The plans to organize elimination of the Prince were coined by the Montenegrin emigration led by Stevan Perovic Cuca and assisted by foreign powers. Danilo's loyal managed to assassin Perovic in Instambul but the resistance to the Prince was not over. Despite improving his relations with Russia Danilo did not manage to keep away his enemies helped by foreign meddling. After preventing several attempt on his life, Danilo was assassinated in August 1860 as he was boarding a ship at the port of Kotor. The assassination was linked to the brutal mistreatment of the Bjelopavlici tribe by the Danilo's guards and his loyal forces. Despite the eventual personal motives, the assassin, Todor Kadic from the Bjelopavlici tribe, was assisted by Austrian authorities in carrying out the assassination.